How long did it take for Spanish to become the dominant language among colonized Native Americans? Contrarily to what many people think, it took a long time (many centuries) for the Spaniards to convert the native Amerindian population to Christianity and to establish Spanish as the dominant language in their colonies. Although the Spaniards set out immediately to convert the locals, the language barrier was immense. 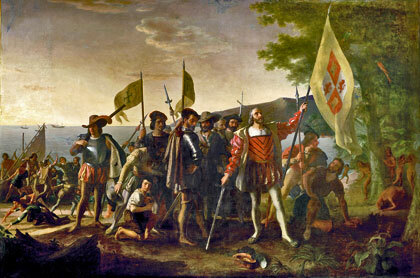 There were approximately 2,000 languages in the Americas around 1500, of which 493 were studied by Spanish linguists. In the 16th century, missionaries had no other choice but to learn Amerindian languages if they hoped to spread their faith effectively. The linguistic conversion took even longer, and is far from complete to this day. There are still 6 million Mexicans who speak indigenous languages, and over 10 million Quechua speakers in the former Inca empire, although they were two of the first regions to be conquered by the Spaniards. The Spanish language spread little by little through the Spanish-born administrators of the colonies, through the work of missionaries and schooling, but most importantly through inter-racial marriages. A popular image of the Spanish colonists is that of the blood-thirsty conquistadors who massacred natives who refused to accept the Bible or Spanish dominion. Although true in some places during some decades, this phenomenon has been vastly exaggerated. In fact, the Spaniards were much more likely to take native brides and recognise their offspring from such unions than the English, French or Dutch colonists. Almost all of the famous conquistadors took Amerindian wives and had mestizo children (e.g. Cortes, Pizarro, Alvarado, Benalcazar). This was a common practice among Spanish colonists because the Spanish immigrants were overwhelmingly male, but also because it was seen as an acceptable practice. This is why Latin America has so many more mestizos than the former British colonies, in whatever part of the world. It was this way that the Spanish language spread, more than by any other means, before the advent of compulsory education in the 20th century. Had the Spaniards refused to intermarry with the natives, Spanish might well have not survived the independence of the colonies. Spanish was indeed quickly forgotten in the Pacific colonies ceded to the United States in 1898 (namely the Philippines, Guam and the Marianas), a sure sign that the language was not yet established after 300 years of colonization. The same thing happened with Dutch language in Indonesia. The Europeans did not only propagate their own languages in their colonies, but also contributed to the survival and expansion of some native languages. It took over three centuries for the Spaniards and Portuguese to diffuse their languages around all their American colonies. In the meantime, they relied on well-established native tongues as lingua franca. Christianity was spread principally though native Amerindian languages, not in Spanish or Portuguese. The languages that benefited the most of their alliance with the new colonists are Quechua in the Andes, Guarani (and the closely related Tupinamba) in Paraguay and Brazil, and Nahuatl in Mexico. All three are still spoken and owe their survival (as opposed to many other native tongues) to their role in colonial history. In contrast, the Dutch almost completely failed to propagate their language in their worldwide colonies. The only notable exception is South Africa, where the Dutch settled in large numbers. The Dutch took over most of the Portuguese colonies in Asia. Portugal and Spain were united under a single monarchy between 1580 and 1640, when the Dutch proclaimed their independence from Spain and captured the Portuguese trading posts in Asia. Such was the Dutch animosity towards the Iberians that they preferred using the completely alien tongues of the indigenes as lingua franca than to resort to using Portuguese, which was already widely understood by Asian traders. This is how Bahasa Melayu (Malay) became the dominant language in Indonesia, under 300 years of Dutch rule. It is now the official and most spoken language in both Malaysia and Indonesia. Therefore the success and diffusion of the Malay language is owned in great part to the European colonization of the Indonesian archipelago. Discuss history, civilizations and population genetics on the Eupedia Forum.